While taking summer trips can be a blast, looking at gas prices can be a bummer. And here’s the kicker: they’re probably not getting better anytime soon. You may already be saving on gas through grocery-store specific programs like Fuelperks, but there are a lot of other things you and your family can do to save even more! 1. Use your most gas-efficient vehicle. If you own more than one car, use the one that gets the best gas mileage most often and especially on long trips. You could take it a step further by trying to use only that car. Yep, that means be a one car family. 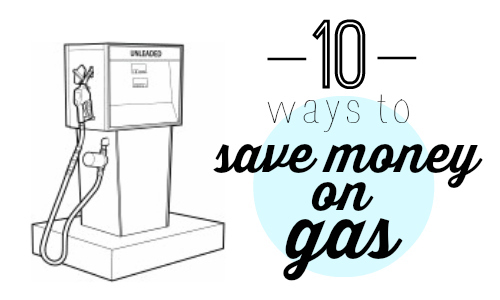 You’ll save on gas and maybe even simplify your schedule. 2. Obey the speed limit. I know it sounds boring, but driving at a slower speed can actually reduce the amount of gas you end up using. Driving at 55 mph is 15% more efficient than driving at 65 mph. 3. Keep your vehicle healthy and happy. By maintaining your car with the basic upkeeps (oil changes, air filter, etc. ), you can keep your car happy and running most efficiently. Check out this older post for a more in-depth explanation on taking care of your car. 4. Clean out your trunk & decrease drag. Extra weight equals extra gas. Clean out the random clutter from your trunk to make your car lighter and, in turn, to use less gas. If you travel with a luggage rack or bicycle rack, consider removing it when not in use. It will make your car more aerodynamic, more efficient, and less gas will be used. 5. Avoid idling. Turn your car off when you’re waiting in that school pick-up line. If your car is going to be still for more than a minute, it will take more gas to run the engine than it will to restart the car. 6. Tighten up your gas cap. Lots of people drive around with broken, cracked, or missing gas caps. Gas can actually evaporate right out of that broken cap causing you to lose some of what’s in your tank. Turn your cap until it clicks after you’re done pumping gas or, if your cap is broken, have it replaced. This can also cost money by killing your oxygen sensors in your engine and those are an easy $150 to replace. 7. Check your air pressure. By keeping your tires properly inflated (not under and not over), you can save up to 11¢ per gallon! Each car’s proper pressure is different, so check your manufacturer’s sticker to see where yours should be. 8. Join Gas Rewards programs. Many national chain gas stations have rewards and discount programs. Get an easy 3¢ off a gallon from Shell Stations and many others. Also look for grocery stores offering gas savings promotions and coupons. 9. Experiment with carpooling. If you’ve got coworkers who live in your neighborhood, try alternating driving times with them during the workweek. You’ll save money on fuel and you’ll reduce your car’s wear and tear. 10. Go extreme. You could always trade in your older car for a more fuel-efficient car such as a hybrid or electric car. Plus, there are federal and state tax incentives available when you purchase one.